South Africa’s shock Test series defeat against Sri Lanka came as a major jolt to a team which had become accustomed to dominating Test matches at home. 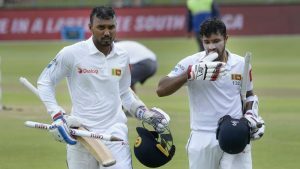 The unheralded Sri Lankans exposed flaws in both South Africa’s top-order batting and their much-vaunted fast bowling attack in winning both Tests in a two-match series. Coach Ottis Gibson was asked after the second Test in Port Elizabeth whether South Africa’s policy of playing on pace-friendly pitches had affected the form and confidence of the home team’s batsmen, who struggled to totals of 235, 259, 222 and 128 against Sri Lanka. The reality, though, is that batting struggles have become a trend, with none of the current top six batsmen averaging above 40 since the start of 2018. Successive series wins against India, Australia and Pakistan were achieved when moderate totals proved enough because of South Africa’s bowling firepower. Gibson’s contract expires after the Cricket World Cup in July and he has refused to comment on the likelihood of staying in the job. The Sri Lanka series has also put the spotlight on some of South Africa’s ageing players. Hashim Amla, a kingpin at number three for more than a decade during much of which he had a career average above 50, has not hit a century since 2017 and his average in 15 Tests since his last hundred is a modest 26.07. He will be 36 when South Africa play their next Test series in India in September and there has been speculation that retirement is imminent. Captain Faf du Plessis, who together with Quinton de Kock was the only consistent batsman against Sri Lanka, is 34 and opening batsman Dean Elgar is 31. Elgar scored only 169 runs in ten innings during the summer against Pakistan and Sri Lanka. Du Plessis, though, said changes were not inevitable. Of the younger batsmen, Temba Bavuma, 28, has yet to justify his promotion to the key number four batting position while opener Aiden Markram has been unable to sustain the outstanding form that marked his debut season in 2017/18. Age is also catching up on the fast bowlers. Like Amla, Dale Steyn will be 36 when South Africa play their next Test. Although he made a successful return to the side after a lengthy struggle against injuries, he was ineffectual in Port Elizabeth, where he failed to take a wicket. Vernon Philander is 33 and under increasing scrutiny for missing matches because of injury. While giving credit to Sri Lanka’s bowlers, Gibson, Du Plessis and batting coach Dale Benkenstein noted that a lack of footage of relative newcomers such as Vishwa Fernando and Kasun Rajitha had hampered South Africa’s preparation. That claim was deried by veteran West Indian commentator Michael Holding, who noted that players in the past had been able to work out opponents before the days of video analysis. Benkenstein admitted there may have been some complacency among the South Africans because of Sri Lanka’s lowly reputation ahead of the series. But this was contradicted by Gibson. Gibson said the series loss came down to South Africa’s failure to “bat them out of the game” after leading on the first innings in both matches. “They had very little to lose and we were just not good enough,” he said. Du Plessis has been candid since becoming full-time captain in 2017 about asking for pace-friendly pitches but he said in Port Elizabeth that he had not made specific requests to groundsmen this season. The post Shock Sri Lanka loss major jolt for South Africa appeared first on SABC News – Breaking news, special reports, world, business, sport coverage of all South African current events. Africa's news leader.. PREVIOUS POST Previous post: Red Devils or Reds for the Big 1?